One day’s worth of filming is what ABC will get from the reality and game show executive producer, Mark Burnett who just wrapped filming for his new pilot game show, “Trust Me, I’m a Game Show Host”. Two hosts of the show, Bill Engvall and Mo Rocca make two different statements to a pool of 160 contestants seated in the audience. These contestants must make their choice of which statement is true and which one is false. The true statements are little known, and obscure facts that the majority of Americans may not know. It winds up being a guessing game for the most part. The pack is weeded out in groups as the ones with incorrect guesses are sent off-stage. Hosts use evidence to present their arguments to sway contestants to their side. Very similar to attorney/jury relationship. During casting for the show one month ago at Mark Burnett Production facilities, casting notices went out that the show was looking for people who were good at reading other people. In reality, the success of a contestant on the show relies more heavily on their ability to use logical deductive reasoning and what facts they may already know to determine which game show host is telling the truth. Hosts for this show should have been attorneys, not two comedians. They were dry, and all scripted! Hosts were placed there simply to follow direction, and to try to prove their statement as being true. Engvall stated that he was unaware which ones were true or false. Set Report of the TBS new version of the same game show here. 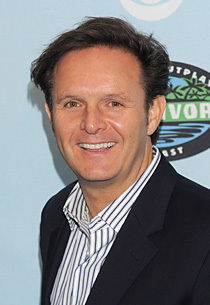 Producer Mark Burnett took to the stage mid-point into the game to talk directly to hosts and contestants. The show had one tie-breaker which was resolved with a question that contestants had to write-down their answers. Seven of the contestants with closest to the correct answer moved on to compete for the grand prize of $50,000. The last contestant standing actually wins $25,000, but has the opportunity to double it with the final question (or statements). It was a tight-knit set today. Game show “Standards & Practices” were very prevalent. Quite the opposite from Burnett’s game show disaster “Our Little Genius” in which a HOLLYWOOD JUNKET source stated that there were no “Standards & Practices” on that set. 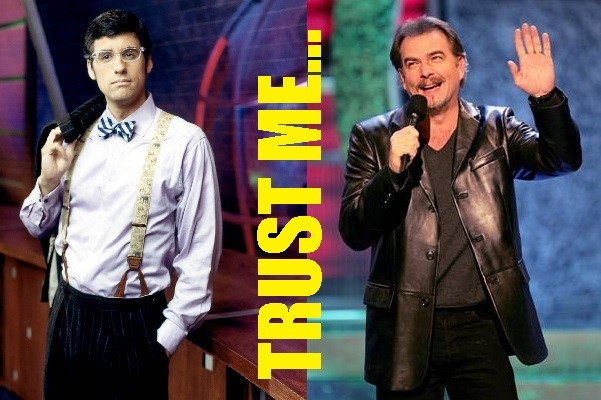 During taping of “Trust Me I’m a Game Show Host”, producers tried to throw-out a set of statements and replace them with different ones, after the small group of contestants left, ALL sided with the same host. A brief break occurred, then producers stated that they were continuing the show exactly where it left off at. Without replacing the statements with new ones. I’m sure this wasn’t their choice, but the enforcement of game show rules. Welcome to game show reality!